Play Games. Make Music. Version 1.1 of the music production studio that plays like a game, KORG Gadget for Nintendo Switch, has been released. This update features quality-of-life improvements and a number of bug fixes. Additionally, a new intro video for Gadget for Switch has been posted. The song used in the video is now available as a demo song. Show us your remixes by using the video posting function using the hashtag #GadgetSwitch. When "random gadget" is selected in Time Limit Mode, the timbre of the gadgets will now also be selected at random. In Time Limit Mode, a "random tempo" function that randomizes the tempo and swing, and a "random scale" function that randomizes the scale and key were added. On the piano roll screen, a “duplicate” function was added that copies the current clip content and doubles it. A scene and track sorting function was added. When editing velocity or automation and setting the tempo, a function for fine tuning by pressing the ZL button was added. A “tap tempo” function was added to the song settings screen. When editing piano roll screen automation, a “clear automation” function was added to the menu. Fixed the tempo settings not being reflected when song data is loading. Fixed the bug where, in some cases, save data could become corrupted. Fixed the bug where, in some cases, Gadget would freeze when editing Kamata. A number of other bug fixes and improvements have been implemented. 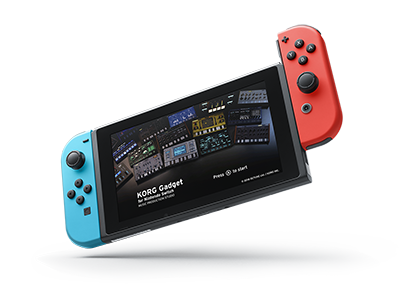 Home News The newest version KORG Gadget for Nintendo Switch has been released.